Andrew Fifita has turned his back on Australia for the rugby league World Cup, joining New Zealand star Jason Taumalolo in defecting to Tonga. 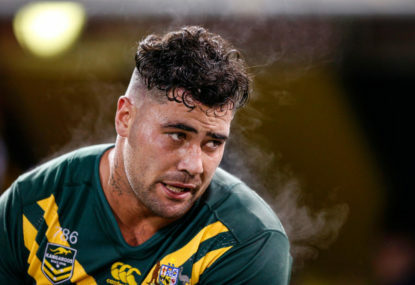 Star Cronulla forward Fifita was named in Mal Meninga’s Kangaroos squad this week but told the coach of his decision on Thursday. NSW representative Fifita has played seven times for Australia. Penrith forward Reagan Campbell-Gillard has been called into the Kangaroos squad. Powerhouse forward Taumalolo announced his defection to Tonga on Wednesday despite playing his last 10 Tests for the Kiwis. News Corp Australia reports up to seven other players could snub New Zealand to represent Tonga at the World Cup in October-November. The Tongan squad will be announced on Thursday morning.